'The Greatest Railway Journey in the World' - this is how travellers from around the globe have described the 41 miles of line from Fort William to the small fishing port of Mallaig on Scotland's northwest coast. 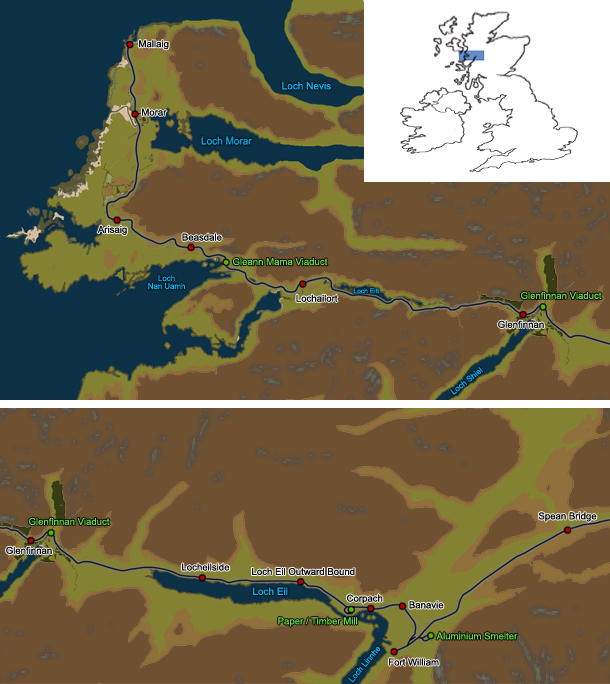 The West Highland Railway from Glasgow to Fort William was opened by the North British Railway in 1894 but it did not provide a direct link to the Atlantic coast and its rich fishing grounds. In order to fulfil that potential, the extension of the route to the port of Mallaig was approved by 1896 and the challenging construction project completed just 4 years later. The building of the line would involve carving a path alongside lochs, bisecting rocky mountainous terrain and crossing deep glens and ravines. Through the pioneering use of in-situ concrete in the formation of the line's bridges, viaducts and tunnels, Glasgow contractor Robert 'Concrete Bob' McAlpine would become world famous in his field. The route boasts 11 tunnels and 8 major bridge structures including the iconic 21 arch span Glenfinnan Viaduct and Borrodale Viaduct, at the time of construction, the world's longest single span concrete arch at 124 feet. McAlpine's innovative methods would enable him to deliver the route a full year ahead of schedule. The completed line transformed travel in this corner of the Highlands, opening up new opportunities for tourism and providing a strong link to new markets for the fish catches landed by the Mallaig fleet. Until relatively recently the railway offered the fastest and most reliable link to the south, the only alternative connection being via a tortuous, predominantly single track road. This is one factor which has meant that the route has never been under any real threat of closure in spite of its lack of profitability over the years. Today the line thrives as a tourist attraction. Steam hauled tourist trains operate two daily return trips between Fort William and Mallaig through the summer. With its world beating scenery and global exposure through a number of blockbuster movies, the West Highland Line Extension has topped the list of World's most scenic railway journeys in recent years. Everyday operation on the route comprises a limited number of passenger services to and from Glasgow Queen Street, formed by Class 156 DMUs. Motive power on the route has been diverse over the last 100 years; NBR and LNER steam classes built specifically for the line operated into the 1960s, giving way to type 2 diesel hydraulic and diesel electric classes. The 1980s brought the much loved Class 37 locomotive to the West Highlands. While the trains operating on the line may have changed over the years, the infrastructure has remained largely unaltered. Concrete Bob's constructions have managed to withstand all that this harsh environment has unleashed and the single line track layout exists more or less as built, with only the harbour spur at Mallaig being truncated in the 1960s. One aspect which has undergone significant modernisation is the signalling of the route. The NBR's original semaphore signalling was replaced in 1987 by Radio Electronic Token Block (RETB) signalling. The system covers the entire West Highland Line as far as Helensburgh and is controlled from the purpose built signalling centre at Banavie. Only the Fort William area is controlled by conventional signals, a combination of colour light and semaphore, from the original signal box at Mallaig Junction. Our journey west begins at the somewhat utilitarian terminus that is Fort William Station. The original NBR station was situated closer to the town centre on the edge of Loch Linnhe but it was relocated in 1975 to make way for a new bypass road. Departure is eastbound along the West Highland proper until we reach Mallaig Junction where the Mallaig Extension diverges to the north. With Ben Nevis towering behind us, the line passes the yard sidings and small servicing depot at Inverlochy. Once over the River Lochy on the lattice viaduct of the same name the line runs across the flat plain at the head of Loch Linnhe towards Banavie. The Signalling Centre dominates the platform at the station; beyond is Banavie Swing Bridge which carries the railway over the Caledonian Canal; the multiple locks of Neptune's Staircase can be seen lifting the canal some 20m as it heads east through the Great Glen towards Loch Ness. The sprawl of development on this relatively level area continues as Banavie gives way to Corpach. The station at Corpach is located adjacent to the lock and basin which separates the Caledonian Canal from the sea loch, Loch Linnhe. On departure, the tracks cling to the side of the loch between the station and the former pulp and paper mill site at Annat. Now a timber processing plant, the site retains some sidings which have become rather overgrown. Beyond Corpach is Loch Eil, the railway follows the lochside for its entire length, flanked by the A830 road. Loch Eil Outward Bound is the next station, a popular halt for those in search of activities on or near the loch. Towards the head of the loch is Locheilside Station, a request stop serving the small community of Kinlocheil. After 10 miles of near straight, level running the character of the alignment becomes more curvaceous and we tackle the first steep climb towards Glenfinnan. As any aspiring wizard will know, the spectacular Glenfinnan Viaduct forms part of a horseshoe curve that follows the contours of the steep mountains either side of the glen at the head of Loch Shiel. From atop the 100 foot high spans of the bridge there are dramatic views across the glen toward the Glenfinnan Monument to the Jacobite rebellion and beyond to Loch Shiel. Glenfinnan Station follows as the track continues to climb at a 1 in 50 gradient. The Victorian station building and signal box are typical of the larger stations on the line and are now home to a museum dedicated to local history the story of this iconic route. Between Glenfinnan and Loch Eilt the 361 foot summit of the line is reached. Descent to the west is rapid beyond the pair of tunnels above Loch Eilt. The track skirts the loch for most of its length, with Loch Eilt's scattering of mysterious pine covered islets almost within touching distance of the train. The loch drains into the River Ailort which we follow the short distance to Lochailort Station perched over the loch of the same name. Beyond Lochailort Station and Tunnel there is a short climb to Polnish. A pair of tunnels are followed by a glimpse of the striking Polnish Chapel, then the railway begins to drop back down towards sea level at Loch nan Uamh. The combination of sea views, sturdy viaduct and dramatic tunnels make this section of the route perhaps the most awe inspiring. The seven arch viaduct spanning Gleann Mama marks the start of Beasdale Bank, 2 miles of 1 in 48. The request stop at Beasdale is situated close to the top of the bank. After the 350 yard Borrodale Tunnel and then Viaduct, the line drops to Arisaig. This is Britain's most westerly station and offers spectacular panoramic views over the Atlantic coast to the islands of Eigg, Muck and Rum. After a further descent the alignment straightens for a level run across open moorland towards Morar. Morar Viaduct crosses the falls on the River Morar, Britain's shortest river, linking Loch Morar, Britain's deepest loch, to the sea. The silver sands and clear waters of this part of the coast can be glimpsed from Morar Station's single platform. On leaving the station there is only a short winding section of line inland before we arrive directly onto the rocky coastline just south of Mallaig. Our destination is reached and we are welcomed by the sounds of the sea and seagulls. Mallaig is a small but important harbour. Ferries from here link the mainland with the 'small isles' and the Isle of Skye which dominates the horizon to the northwest. Fishing activity is much reduced compared to that when the railway came to the village. Today it is the railway that generates activity, when the tourists alight and go forth on their search for a good plate of haddock and chips. Returning to Mallaig Junction, the West Highland Line continues in an easterly direction along the foot of Ben Nevis, Britain's highest mountain, bound for Spean Bridge and the south. On the outskirts of Fort William the former British Alcan aluminuim smelter nestles in woodland in the shadow of Ben Nevis. The smelter is the UK's last surviving aluminium manufacturer and still generates a good flow of freight for the railway. The site has a number of sidings with a connection to the West Highland Line at Lochaber Junction. Between Fort William and Spean Bridge the landscape is more lowland in character, the railway cuts through the farmland and forestry of The Great Glen. The route running parallel with the main road to Inverness. 8 miles from Fort William, Spean Bridge Station is a beautifully preserved example of North British Railway architecture. The signal box dating from the 1940s remains intact but out of use. Beyond Spean Bridge the line continues due east towards Tulloch where it turns sharply south as it heads towards Glasgow.